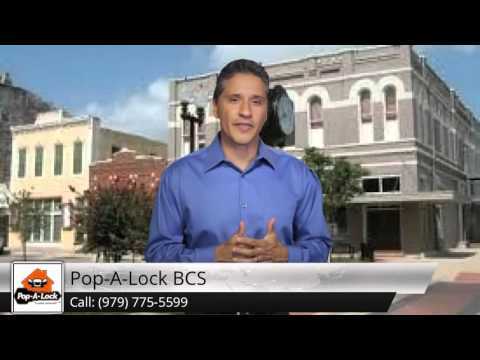 Pop-A-Lock is Bryan-College Station, TX most dependable and affordable mobile locksmith. We are Bryan-College Station's most professional and trusted locksmith. Thousands of people just like you have learned to trust Pop-A-Lock of Bryan - College Station for their locksmithing needs. When you have an EMERGENCY and time is of the essence, don't waste time by calling anyone else....Call the Locksmith Service you can trust....Pop-A-Lock of Bryan - College Station. We have developed a reputation for fulfilling our customers' needs quickly and professionally with a high level of customer satisfaction. When you have a lockout situation or need emergency roadside service, our team of licensed professionals will respond in a timely manner. Just call our Bryan - College Station dispatch number to the right. Whether you're locked out in Bryan, need new car keys in Benchley, or want to change the locks on your business in College Station, Pop-A-Lock of Bryan - College Station has the proven expertise and friendly service you can depend on over and over. When you want piece of mind in knowing that your home, car, or business is safe, we can help. We're ready to help you 24/7, and we will come to you in any weather conditions. No excuses. We also offer our emergency door unlocking service through our PALSavesKids program. If a loved one, child, or pet is locked in a vehicle, call Pop-A-Lock of Bryan - College Station. We will make this serious event our priority and pop the lock free of charge. 24/7 Lock out and roadside assistance service for Bryan-College Station and surrounding areas. Free Emergency Door Unlocking when child locked inside. Auto, Residential and Commercial Lock smith services also available.